Bronze AE3, 22mm, 5.12gm, issued AD 386. Cyzicus mint. Obv: DN ARCADIVS PF AVG, Diademed, draped bust facing right, Manus Dei above. Rev: GLORIA ROMANORVM (SMKΓ in ex. 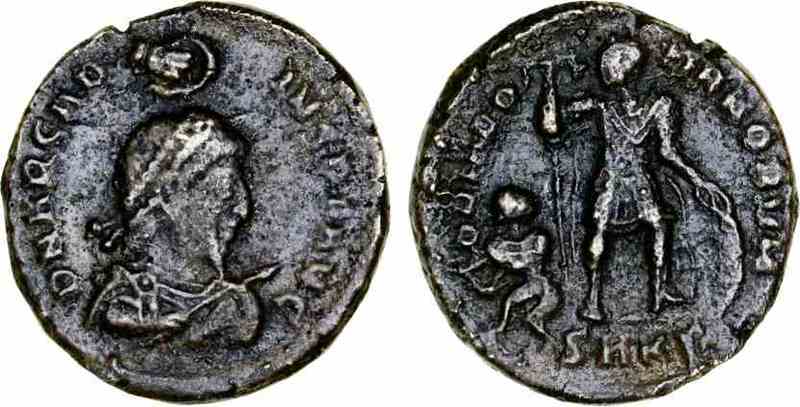 ), Emperor standing holding standard and shield, captive at feet. References: Sear 20787, RIC 15.